Cloth Diaper Revival: #miniSPbdaybash Day 6! Prizes from Kelly's Closet, Baby Mushroom, Sticky Bellies, and Rock-a-bums! 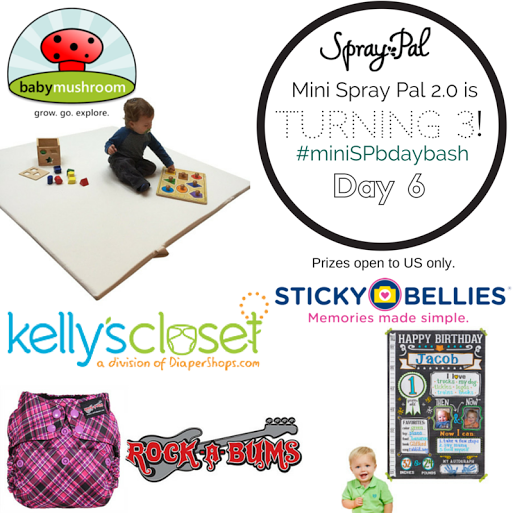 #miniSPbdaybash Day 6! Prizes from Kelly's Closet, Baby Mushroom, Sticky Bellies, and Rock-a-bums! Mini Spray Pal 2.0 is turning 3! What better way to celebrate Ryan than with a giant giveaway every day! The Spray Pal family has won the hearts of the cloth diaper community (and beyond!) with their incredible story of Ryan hearing for the first time. If you haven't seen the below, it's a must watch! This giveaway is open worldwide and the prizes for today are amazing! Be sure to check out the Spray Pal blog so you don't miss one of the many birthday giveaways! 4 weeks or 1 month next Thursday! We would be putting an 8 month sticker on her little belly. My next belly sticker would be a 6 month sticker - due in July! 2 years for next month, and a next belly sticker would be 5 months! Due in August with number two! My son turned 2 last December and I used sticky bellies poster. When he turns 3 this year I would do the same! My DS' s next milestone is 6 months! Where did the time go?!? I am due with my first child in April!! My son would wear a 15 month sticker next. Thanks! Id use them for the next kiddo! I'm expecting in the first week of May! #3 will be 1 on Tuesday and our #4 is due early May. Thank you for chance to win. My youngest turned 1 in January and we just started cloth diapering and I'm loving it! My oldest turns 4 in June!!! First one due in May!! My son just turned one in February!